You can get a sense of how much people enjoy the look of Google’s Ice Cream Sandwich when developers and theme artists are actually inspired enough to create work that mimics it. A team of developers by the name of Team Gummy over at RootzWiki has gone ahead and created three individual live wallpapers that play on the ICS live wallpaper named Phase Beam. By replacing the floating spheres with icons, it’s just another way for people to create a look of their very own. Install as you would any 3rd-party app, but do note that from what I experienced, you can only have one installed at a time. Note: For those who may ask, the icons I am using are called ICS Plates and they can be found here. Cheers Gary, Kejar31, and Team Gummy! 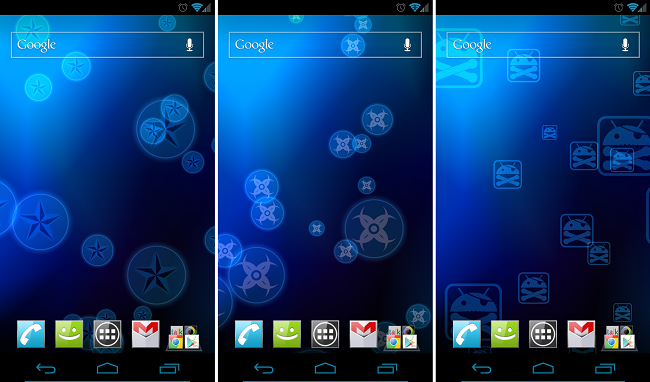 DROID X2 Software Update is Ready as Build 1.3.418, Includes a "Google Security Patch"